While it remains to be seen as to which two teams will make it to the World Series, it turns out there's at least one thing related to the baseball championship you can be fairly certain about right now: you're going to get free Taco Bell out it. 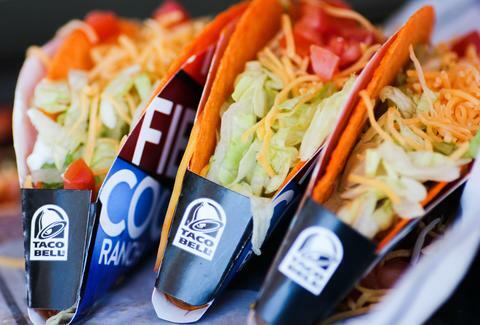 That's right: free food from Taco Bell, thanks to baseball. For the fifth year, Taco Bell promises to reward everyone in America with free tacos upon the first stolen base during the World Series, which begins on October 25th. Specifically, if a base is stolen during Game One or Game Two of the Series, participating T-Bell locations nationwide will hand out free Doritos Locos Tacos on Wednesday, November 2nd, from 2pm to 6pm. But if the first stolen base of the Series doesn't come until Game Three or later, the free Doritos Locos Tacos won't come until Thursday, November 10th, from 2pm to 6pm, according to a press release. During last year's "Steal a Base, Steal a Taco" promotion, America scored free A.M. Crunchwraps from Taco Bell when Lorenzo Cain of the Kansas City Royals stole second base in the sixth inning of Game One of the 2015 World Series. A similar promotion over the summer resulted in free Doritos Locos Tacos during the NBA Finals. So, whether you're interested in professional sports or not, you can at least get your hands on some free Taco Bell. Of course, we'll keep you updated on when someone steals a base during this year's World Series. Tony Merevick is Cities News Editor at Thrillist and could go some Taco Bell right about now. Send news tips to news@thrillist.com and follow him on Twitter @tonymerevick.